A Quick German Lesson, Anker? Anker Steinbaukasten? Anchor Stone? Yes, and yes, as Anker translates to "Anchor" and Stein translates to "Stone". 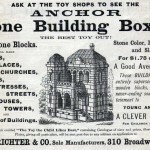 Baukasten can be broken apart to "building box" or "building set". So in German, the company and brand name is currently Anker and Steinbaukasten describes the product - stone building sets. This entry was posted in News and tagged New York, language on April 20, 2016 by Randall Hertzler.